In 1998, Derek Brock and Jason Cunningham combined their quick service food industry experience to create Jugo Juice, an innovative offering of fresh juices and smoothies. Fueling your healthy lifestyle with healthy choices on the go, the Jugo Juice brand is recognized as an alternative to mainstream fast food. Category pioneers, the success behind Jugo Juice is its unwavering commitment to a healthy product offering. Capitalizing on the movement toward healthier foods offered within the quick service food category, Jugo Juice has gained significant momentum and today has more than 140 locations across Canada. Jugo Juice has also expanded its menu choices in recent years, building around its signature product of juices and smoothies to offer other in-demand and delicious favourites like grilled wraps and flatbreads. Growing from a ‘smoothie-only’ company to a healthy lifestyle brand, Jugo Juice still has further plans to expand its menu of grab-and-go selections. The niche of the Jugo Juice format is its non-traditional locations, with new franchise growth strong in post-secondary schools, airports, fitness centres, and hospitals. “These types of locations are approaching us as the preferred vendor in their establishments,” Claypool explained. “We have had a lot of success with these formats. Not only has Jugo Juice grown its national presence, but also its target market. Formerly focusing on the 18-to-36 demographic, Jugo Juice has grown its vision to include consumers who focus on nutrition and healthy eating. Additionally, in the coming year, Jugo Juice will launch its youth menu in an effort to promote healthy living at an early age. As part of this long-term strategic initiative, Jugo Juice is preparing to partner with schools across Canada to promote health and wellness programs, involved in the education of healthy alternative foods. In a diverse market of alternatives to traditional fast food, what makes Jugo Juice unique is its commitment to ‘clean’ ingredients. Its product integrity is such that no fillers, such as sorbet, are used. A Jugo Juice smoothie contains only healthy components, like five servings of whole, fresh fruit – no puree is used, unlike several other competitors that have recently entered the smoothie category. The Jugo Juice menu is the only one of its kind, in that it is 100 per cent sorbet free. Jugo Juice offers a product that is richer in colour, nutrition, and flavour. Jugo Juice also recognizes that ‘not all fruit is created equal’ and only uses the best grown fruit in its juices and smoothies. Blended from frozen, portioned fruit packages, Jugo Juice selects fruit at its peak ripeness, then flash frozen in order to capture and maximize its taste and nutrient value. 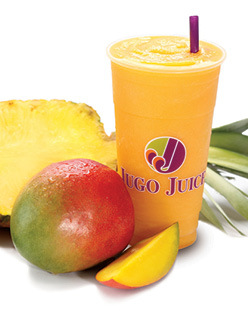 A Jugo Juice smoothie is made with fruit of the absolute best quality.